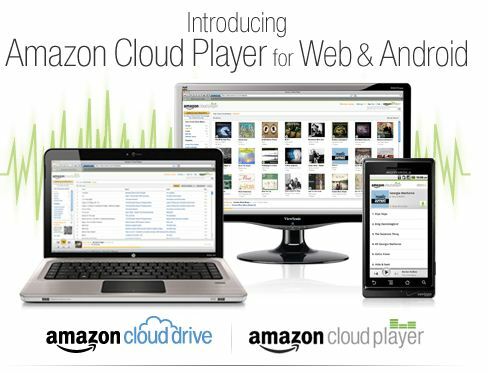 This morning, the Amazon Cloud Player launched, and I must say, I am impressed. As with most things Amazon, they went all out. It launches with 5GB of storage out of the box just for having an amazon account, an Android app, as well as a nice web player that works quite well. All of your playlists and music automatically sync so that you can have the same experience, no matter what device you are using. And if 5GB isn’t enough, it won’t be for me, you can buy more storage 20GB for $20 per year, or buy an MP3 album and automatically be upgraded to that 20GB plan. There are even albums for less than $1 on Amazon that meet the criteria. And if you download that album or any MP3 from Amazon to your cloud drive first, then it won’t count against your space. So you can buy as much from Amazon as you would like and it isn’t part of the 5GB or 20GB size restriction. It can sit there indefinitely. Also, if you go to your amazon MP3 settings on each computer you will be accessing it from, you can set your download setting. “When you save your Amazon MP3 purchases to Cloud Drive, you can download new purchases from Cloud Drive to this computer automatically.” So I can have it automatically download files to my desktop, but download on demand on my laptop. Pretty sweet. And you don’t have to just store mp3′s on there, but also any other file you would like, but obviously you get the most flexibility out of MP3 files. And when I say MP3 files, I don’t necessarily mean MP3′s exclusively can be used, you can actually upload Apple’s m4a files as well so that you can listen to them using your amazon cloud player as well. Wav files and ogg are out of luck, but most people have mp3 and m4a as it is, so you should be good with most of your collection. And of course, Amazon makes it easy to click on an artist and shop for more music from that artist in the Amazon MP3 store. There is even a really nice Adobe Air MP3 uploader from Amazon that automatically scans your Windows Media Player and iTunes libraries for files and playlists and lets you choose what you do and do not want to upload. I am listening to it right now on my Android and it is working extremely well over a Wifi connection and I’ll have to try it out over a 3G connection to see if it can keep a good connection. But if Pandora can do it, there is really no reason that Amazon can’t. It does give you the option of downloading the files from your Cloud Drive to your Android device in case you will be out of range and need something to listen to, but that kind of defeats the purpose. I do have a few things that I wish I could do that I can’t. I have a few files that I have ripped that didn’t have track info and it uploaded and of course the album and artist are “unknown”. I wish there was a way, other than re-uploading the file, that I could edit that information, but as of right now I don’t find a way to do that. I also do wish that it had an iOS app, but I am sure that is coming. It probably just takes awhile to get it through the app store approval process. I tried to use the web player on the iPad, and though it loaded, I couldn’t actually get my files to play. But I was able to download them to the device, which I guess would work if there was one file you wanted to listen to. I also wonder how long it will be before there is a Roku app or it is built into my Tivo. Because that is one piece that will make things much more interesting as Amazon Video on Demand is already in the living room, and putting Amazon MP3 in the living room would seriously upgrade the home theater capabilities of most people’s homes by having their MP3 collection easily accessible without having to go through all of the steps of finding it on your network. The real test is going to be when Apple or Google announce an inevitable competitor to Amazon so we can see how each of these monster companies handles the same task. But with Amazon being the first player of the big boys to do this, it definitely gives them the edge. If people get comfortable with their product and invest early, then that gives them an upper hand on these other competitors that would be more likely to own this space and allows them a good shot at owning the cloud MP3 space. Anyway, try it out at Amazon Cloud MP3 or watch the nice little intro video to learn more. I bought amazon cloud mp3 player. I like it, but I wanted to be able to download music to my craige mp4 player from my cloud player. Can I do it? My Craig mp4 player has 4G’s of space, and it is not a phone just a mp4 player. I don’t know if it operates on the andriod system, but it can play video’s an it has a FM radio app in it. Do I have to download music to my Windows Media Player first, then to my mp4 player? Please Respond! Unfortunately you do. You will have to download it to your computer and then upload it to your mp3 player if it isn’t an android device.